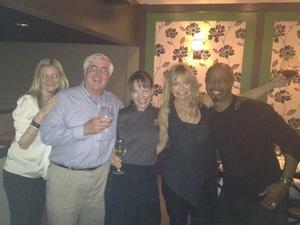 Laura Werlin, Gail Simmons, Tim Nugent, and Jen Biesty. Photo from Twitter. 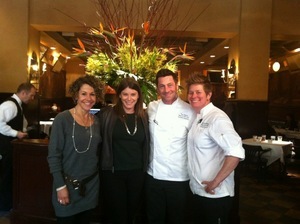 In town for her reading tonight for her new book, ~Gail Simmons~ paid a visit to Top Chef alum chef Jen Biesty at Scala’s Bistro for lunch with the “Cheeze Lady,” Laura Werlin. The ladies had Laughing Bird shrimp bruschetta with fennel purée and squid ink aioli; Dungeness crab salad with blood orange, Treviso, green aioli, and chervil; and a funghi pizza with Spanish chorizo, Bloomsdale spinach, and Fontina Val d’Aosta. Pastry chef Tim Nugent sent out bergamot granita to finish. ~Haylie Duff~, the actress and singer-songwriter (and older sister of Hilary Duff), came in to Barbacco with a friend for dinner. She was reportedly “super nice,” and the dining room manager poured her some orange wines (which she loved, and even shared with the table next to her while explaining what it was).